I finally did it! After all the time I've known about Tone It Up and wondered about the Nutrition Plan, I finally bought it. It took the Cyber Monday deal they were offering (and some nicely-timed bonus money) to finally push me over the edge. 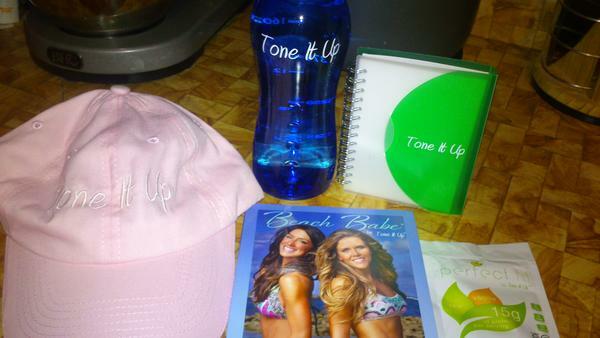 I got a TIU hat, water bottle, journal, Beach Babe workout DVD, packet of PerfectFit and a TIU decal for ordering that day. You know me, I'm always searching for a good deal! But really, I'm so glad I finally did it. I didn't quite know what I would be getting, but it's well worth it. 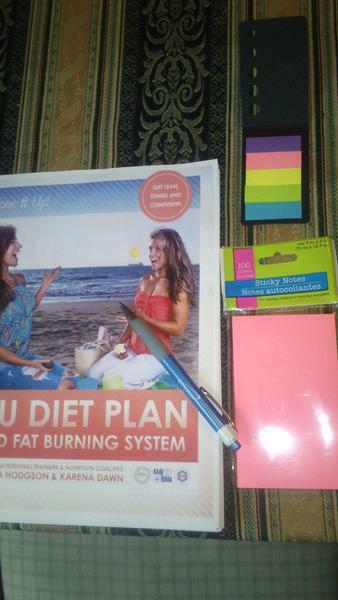 First, with the wealth of health information and recipes out on the web, I didn't think I really needed to spend a significant amount of cash on this plan. However, once I got the plan, it was much more helpful and organized than I could have probably mustered on my own. You are given plenty of recipes and meal options for all six "meals" of the day. Plus, the girls have certain food groups timed throughout the day for optimal metabolism-boosting and sports performance. Every new season brings along new updates to the plan--all included for free! It's super exciting whenever a new update comes out. The emphasis of the plan is on Lean, Green and Clean foods. In other words, "real" foods or the closest to nature-made foods as possible. So far, I've noticed that when I eat on this plan for a week and then indulge in "unreal" foods for one meal (i.e. taco or burger + cookie), I get a stomachache. I guess that could be a good incentive to keep eating as healthy as possible. This is how we should be eating all the time anyhow, so I don't consider it a "diet" per se. You can tell that Karena and Katrina put a ton of work and manpower in putting the plan together. Plus, once you're part of the team, you're really part of the team. There are so many special "members-only" perks and challenges that once you sign up, you finally feel like part of the TIU "in crowd." I didn't quite realize what I was missing until I went all-in. 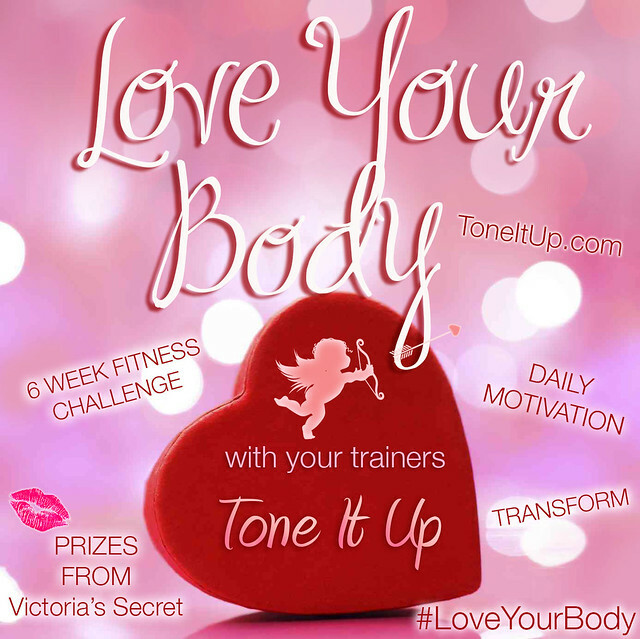 This week kicks off the Love Your Body series and I've been doing everything they tell me to and then some. Here's a breakdown of what we were supposed to do to prepare. 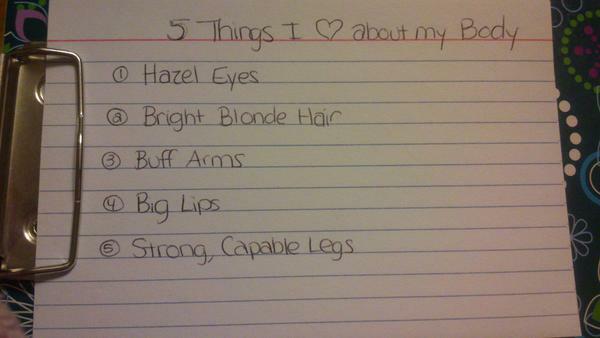 *I should've added: "Strong pain tolerance." I am so thankful for that. This was a tough exercise to do. It was hard to come up with five things and it felt vain, but really, it's good to be thankful for what our bodies can do. I guess I'm also thankful for strong lungs, powerful abs (my baby doctor almost didn't make it in time), and a kick-a$$ immune system. Whoa whoa, what's that you see? Become a personal trainer? Yep, it's on my list of things to do before I turn a certain age (ahem) in June. NASM it is! I'll keep you posted. I guess since I've finally written it now, it must happen right? Good incentive. Tuesday: 40 minute Tabata Inferno on the Supreme90Day system + 20 minute barefoot treadmill run (we'll talk more about this later). PM: 45 Cupid's Cardio interval run on treadmill w/ friend. I already have plans to go with another friend to the gym tomorrow (Friday) at lunch for strength training along with cardio in the morning. Pre-planning + Recruiting Friends = Success. How are you doing so far this year? 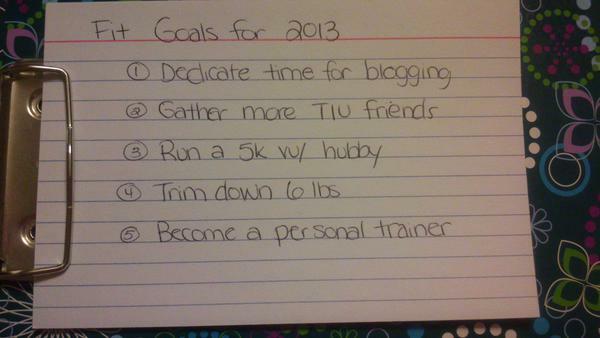 What are you Fit Goals for 2013?